A story from the conservative Daily Caller is raising questions over whether Republican presidential candidate Michele Bachmann gets migraine headaches that can incapacitate her for days at a time - as well as why her former allies might offer up such information. The story, which cites "three people who have worked closely with Bachmann," charges that the Minnesota lawmaker was hospitalized at least three times last year for stress-induced severe headaches. It says the migraines occur roughly once a week on average and can "incapacitate" Bachmann for days. Asked about the report, Bachmann spokesperson Alice Stewart had this to say to CBS News: "Millions of Americans suffer with migraines. Congresswoman Bachmann does have migraines, and they are treated with medication." Stewart is quoted by the Daily Caller saying the migraines are "under control" and charging that the information in the story is "incorrect." 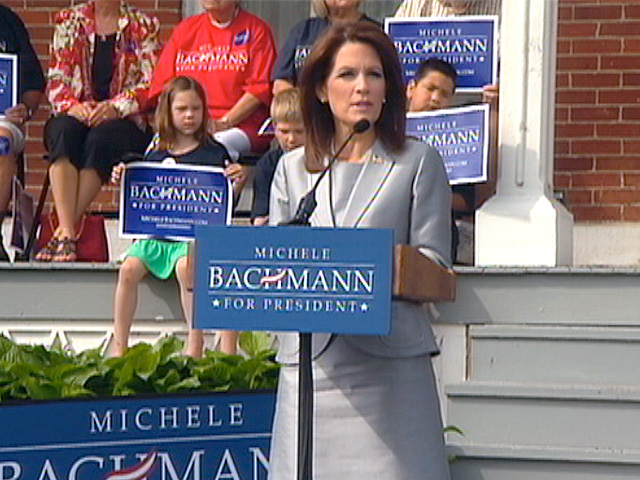 She declined to discuss Bachmann's medical history. Bachmann's congressional office acknowledged that she was hospitalized in July 2010, but it would not discuss the reason. The story says she was also hospitalized in May 2010 in Los Angeles after being "desperately sick from headaches" during her flight to the city and in October 2010 after falling ill (and being put into a bed) at a fundraiser in Connecticut. The sources are described as acting out of concern that Bachmann could be incapacitated during a crisis if she becomes president as well as concern that she could lose badly in a general election campaign if the migraine issue takes center stage - not from a desire to bring down a former boss with whom they are now on bad terms.